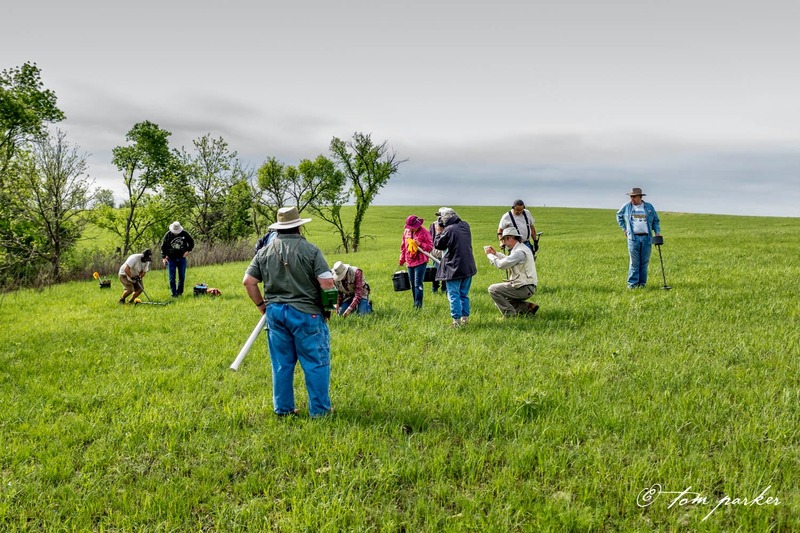 Several months ago the Wheat State Treasure Hunters invited Dr. Bob Hoard to one of our meetings. We were intrigued about the differences between archaeologists and mder’s. There was a certain something that spawned from that meeting. Pulltab Miner and I thought that Dr. Hoard seemed pretty open minded. During his meeting he discussed using metal detectors as a tool. We suggested that maybe in the future we could work together on a project or two. Fast forward a few months and I received a Facebook message from the Dr. asking if I would like to help them on a dig at the beginning of May. I told him that I would be really interested in doing so. Pulltab Miner and I agreed to help them out on a exploratory investigation some 3 hours from home. Pulltab Miner and I were told to be at the dig site at 9 in the morning. We left my house at a little before 6 and headed North. We skidded the Rav into the dig site with 5 minutes to spare. 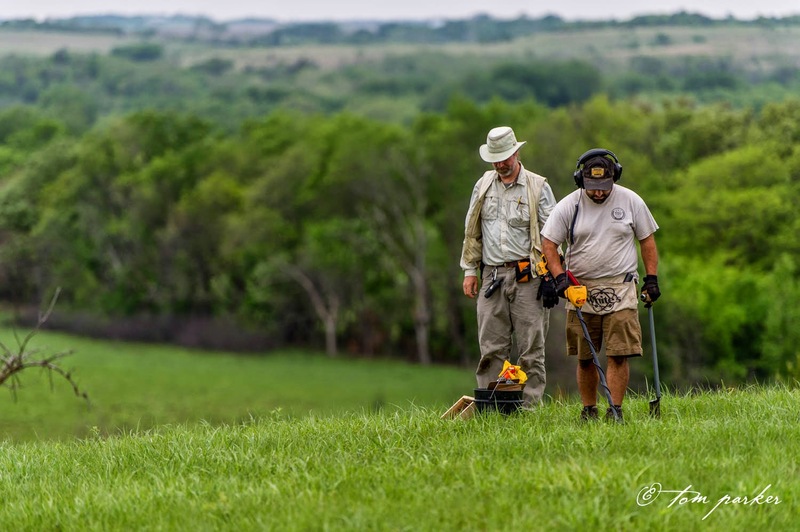 We were greeted by folks from the Kansas Historical Society, the Kansas Anthropology Association, a representative of the landowner, and a few volunteers including two other metal detectors. The site is a very historical site that is part of the historic register. The land is owned by a non-profit organization that wants to create a more tourist like area. This includes parking lots and a natural amphitheatre type area. Our goal was to see what was lurking under the ground where the parking lots are planned. After a short briefing and some introductions we move to the North end of the property where one of the parking lots will be. It started off kind of slow for me. Each person running a metal detector was accompanied by an excavator (don’t think backhoe here). The excavator was kind of like a recorder as well. Any artifact that they thought to be period would be logged via GPS, bagged, and later inspected by the Archaeology team. I was the chosen one to work directly with Dr. Hoard. I think he was losing faith in me because the first few signals I tried to retrieve were ghost signals. I started putting things together and realized that on each attempt there was a sizeable rock below. 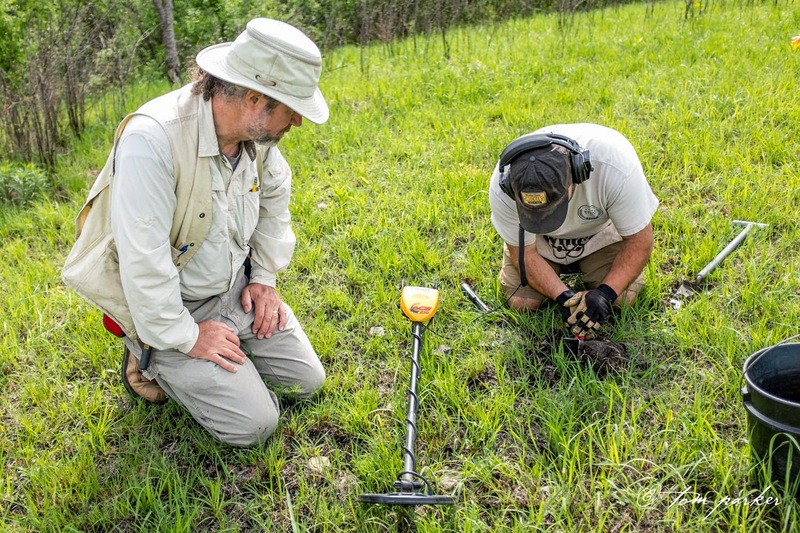 He was intrigued and I showed him that sometimes a signal is there but once you move soil, rocks, and generally disturb the area it could disappear. We worked the field back and forth several times. On one of my last passes I managed to find what I believe was the first dated artifact of the day. It was a shield nickel that was lurking just under the surface. It has rays on it which means it was either an 1866 or 1867. I couldn’t get a date off of it. We all celebrated and the nickel like every other artifact got logged by GPS, bagged, and given an artifact number. One of the volunteers made a joke about me not doing a back flip. So I jokingly did a pseudo roll down the hill. It was a fun moment and we proceeded on. Given that we had covered the area quite well we were nearing the end of this particular site. 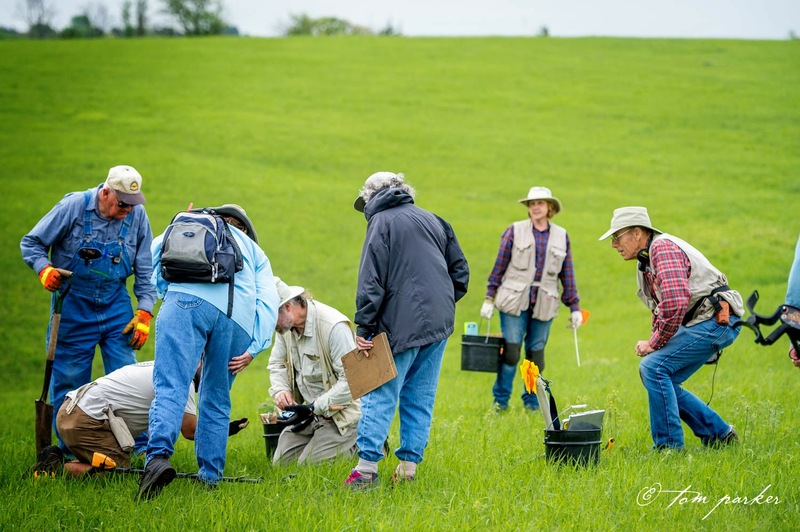 I took the opportunity to open some discussion about finding artifacts and retaining them. Dr. Hoard and I spoke for only a few moments about the system Europe has for collecting data about finds. After our discussion I don’t think it would take much to implement such a system here in the states. He reiterated the fact that they truly just want to know information. They don’t want our finds that we find on our own. They would just like to have a record of it. Now I know that there are some MDer’s out there that keep pretty meticulous records about finds. I will also be the first to admit that my blog is the only real record I keep of my finds. After spending a day with these guys I can understand why they would like the information. Would it take more of my precious time to keep a log of finds and GPS coordinates? Yes. Would I enjoy keeping a log of all my finds? Probably not. However I can also see the benefit of having that information whether it is for me or for the archaeologists to review. In my mind we are all trying to figure out history and grab a little piece of it. Personally I have turned one of my sites into the KSHS for documentation. I haven’t seen a dig team on that site and I doubt they will ever do anything with it. It’s not a highly historic site but in case they ever decide to build a Taj Mahal on it they will know what has been recovered there thus far. I have to ask the question though. How many metal detecting hobbyists would take the time to log all the information from their sites? Now I know there are folks out there saying that as soon as I let them know what I’ve found they will be all over it. Dr. Hoard said somethings that made me think quite the opposite. They have used peoples personal collections as a tool to learn more about a site. They don’t take the collection and never look back. My thinking is this. If you find a good site detect it to your hearts desire, make a detailed record of it and collect things in a responsible way, once you are done with the site go ahead and give the archaeology department the information you have. They won’t steal what you’ve collected and they won’t hassle you about it. They may be impressed and ask to borrow your collection for display and investigation but they still have to have funding, time, and permission to turn it into an archaeologists full dig site. Anyways I digressed from this trip. We finished up at that particular site and moved further down the trail. In this particular section I found what seemed like a period correct bullet that had hit something and sheered into two pieces. We proceeded to joke and have fun. Miner had shared with me that the fine lady helping him had made a comment about once you find a nickel you can then sluff off and stand around and talk. This among with finding a rusty modern wingnut led to several jokes and laughs between the group. It was fun and I think we all learned something. Dr. Hoard as well as other volunteers were intrigued by how much we could tell by using the metal detectors. I was impressed with how knowledgeable they were regarding artifacts and sub surface items in general. As the afternoon moved on we did as well. We went to the “homestead” area that was as far as I could tell some kind of dugout or log home that was quite small. Our detectors immediately went nuts with all the iron in the ground. I managed to dig several pieces of an old stove top, the back half of an axe head, and a harmonica reed. Miner shined in this spot and found a couple of buttons and an old serving fork. We eventually moved to a different part of the area that was heavily used and still had wagon swells from the numerous wagons that passed over the ground headed west. The bad news was the fact that a quarry had operated on this particular piece of land for many years in the 20’s and 30’s. I didn’t find much but we finished the day out here as thunder and lightning bared down on us. In closing I want to say it was a great time and very eye opening for me. 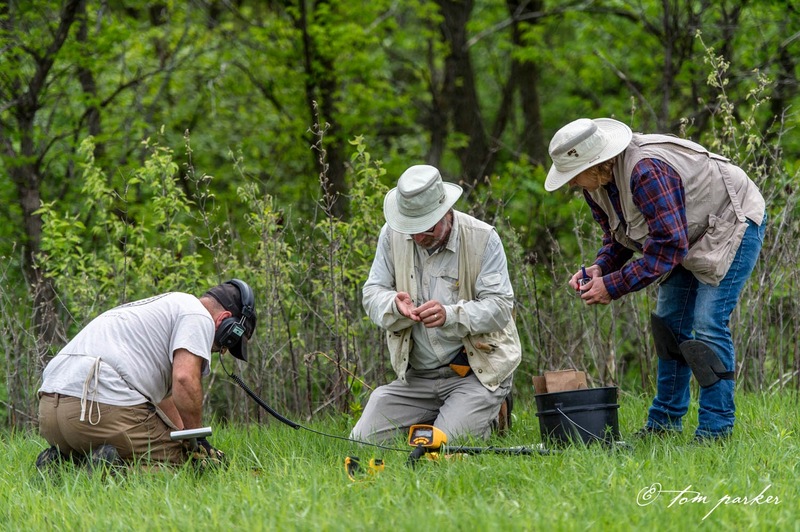 I’m not saying that us detectorists or detectoristas are looting and causing bad, however I wonder if we should be more diligent in what we do? As we were winding down Dr. Hoard asked if we would be interested in bringing the club to the site for a full day of detecting and recording. I think most the people in our group would be willing to do it considering the site is full of history from the time before we even became a state. On the ride home Miner and I had a couple conversations and one thing he said struck me. As there is a new wave of people joining both forces will we work more closely together in the future? I think it is a possibility. 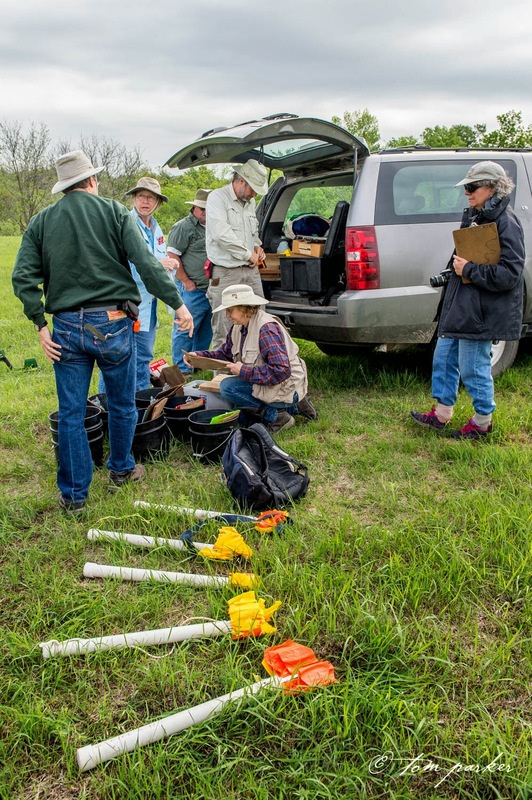 One of our club members sent me a link to a group in New Mexico I believe that held an event that would give archaeologists a more thorough understanding of metal detectors, how they are used, and what you can do with them. I see this as inspiring however I couldn’t find anything that stated how many archaeologists attended the event. I personally want to say thank you to everyone that helped out on Saturday and I hope that we can do this more often. Working away under a cloudy sky. Working our way across the hilltop. We were checking out something and making sure nothing else lurked below. I believe this is when I found the coin!